Houghton Bay Saturday 31 Jan.
We had a session at the Houghton Bay stream this afternoon. It was reasonably successful with 65 birds caught of 9 species = 57 new and 8 recaps. Greenfinch - 8 (1) The recap was banded Sept 2012. A group of us spent this morning at the stream site over the fence from the Zoo. Numbers were down on recent sessions but we still had a reasonably successful morning. Caught 26 birds of 8 species with 21 new and 5 recaps. As was the case with our previous session at this site we had Kereru come down, possibly 2 birds and although a net was hit twice neither stuck. Chaffinch - 3 (2) 1 of the recaps had been banded at the Houghton Bay site 2 weeks ago and the other at Island Bay 1 week ago. Goldfinch - 4 (2) the oldest recap was banded at Houghton Bay in March 2013. Silvereye - 2 (0) the first and last birds caught. One of the Tui was a newly fledged male. Prince of Wales Park Sunday 25 Jan. I had a session at the Prince of Wales Park this afternoon. Unfortunately it clashed with an Ornithological Study Course and other activities such as a wedding and Prion feeding so I was the only bander. Fortunately I was assisted by 3 enthusiastic young assistants, Rory and George who have been to session before and Maddie who was out walking with her father and younger brother. She became interested in our activities and stayed and joined in. We had fewer nets up than usual but still managed to catch 38 birds. Most were House Sparrows with 30 new and 2 recaps. Both the recaps were banded on 2 Feb 2013. Other birds were 3 Goldfinch, 2 Greenfinch and 1 Silvereye - all new. Maddie's father is a local brewer and has birds feeding on grain spilt around the brewery and invited us to try and catch them. Somehow the idea of catching birds at a brewery seems to appeal. Bridget and I had a session at the Houghton Bay stream this morning and we were joined by George, a keen and knowledgeable lad, along with his mother. Numbers were down on the recent high tallies but we still managed to catch 43 of 7 species, 39 new and 4 recaps. A noticeable trend is the increasing percentage of birds that have commenced their moult. And with a flick of its tail it's off. Annette, Mary, Kate, Sarah V H and I had a successful session at our Island Bay site this morning. We had very good conditions and as usual great hospitality from our hosts Marion and Ken. Three of the team at work. Kate about to release a Blackbird while Annette explains some banding details to our scribe Mary. We caught 140 birds of 7 species with 121 new and 19 recaps. This is very similar to the December session when we caught 140 with 123 new and 17 recaps but there was a bigger variety today. We didn't catch any Tui, in fact we didn't even see any, just heard a couple. Last month we caught 7 and saw probably 30. Blackbird - 13 (2) all the new birds were juveniles and 1 of the recaps was banded in August 2009 so a reasonably old bird. Chaffinch - 9 (0) mostly juveniles. Dunnock - 5 (0) all juveniles. House Sparrow - 87 (17) The usual dominant species at this site. The oldest recap was banded in Oct 2010. A few of the birds had started moult. Starling - 4 (0) 3 out of the 4 were in primary wing moult. We had a session at the stream just outside the Zoo this morning and although a bit quieter than the last couple of sessions we still had a steady flow of birds. The final total was 56 birds of 7 species with 47 new and 9 recaps. Most of the team at work - Luke, Kate, Henk and Bridget. A highlight of the morning was a bird we didn't catch, a Kereru (NZ Pigeon) which came down to drink. Fortunately it flew out over our heads and away from the nets as we haven't a permit to band them and it probably would have flown straight through the net anyway. This is the first one I have seen at this site. Kate with one of the juvenile Blackbirds - 3 were juvs and the other a 1 year old. Chaffinch - 6 (1) the recap was banded 4 years and 1 day ago on 15 Jan 2011 as an unsexed juvenile at the same net site. This was it's first recapture. House Sparrow 2 (0) Henk also reported the recovery of a H Sparrow found dead. It was banded in Feb 2010 just a couple of weeks short of 5 years. Silvereye - 18 (5) the oldest recap was banded June 2011, subsequently recaptured at Houghton Bay and is now back at the Zoo. Houghton Bay Wed. 14 Jan. - over the ton of birds. A group of us had an extremely successful session on Wednesday afternoon catching 124 birds. There were 9 species with 100 new and 24 recaptures. Silvereye - 61 (20) The oldest recap was banded almost exactly 8 years ago on 21 Jan 2008, which was our second session at this site (the first was on 19 Jan 2008). This bird is now 2550 days from banding - our oldest bird banded and recaptured at this site. Tui - 2 (0) one was a newly fledged male still to grow it's white throat tufts. Fantail - 5 (0) all were juveniles. Sarah J looking rather pleased after banding her first Fantail. Prince of Wales Park Sunday 11 Jan - Heaps of birds. Ros, Ross and I had a very successful session on Sunday afternoon at the stream in the Prince of Wales Park. We caught 85 birds of 10 species, all were new (we did make 1 recapture but it turned out to be a bird from earlier in the day). This is the highest daily total at this site and the catch was dominated by 2 species - House Sparrow 35, which is almost double the previous highest at this site, and Goldfinch 29. Other species caught were - Chaffinch 3, Greenfinch 6, Silvereye 5, Tui 3 and 1 each of Yellowhammer, Blackbird, Starling and Dunnock. Ros and Ross at the banding station which was a handy grassy bank. A fist full of birds in bags. Ross showing a delighted and delightful small girl and her mother a bird close up. Ross and I had a very successful session at the stream over the fence from the Zoo this afternoon. The stream at the moment is actually just a series of small puddles but birds find them enticing. We caught a total of 69 birds of 9 species with 59 new and 10 recaps. Surprisingly several birds were found to have already started primary moult. 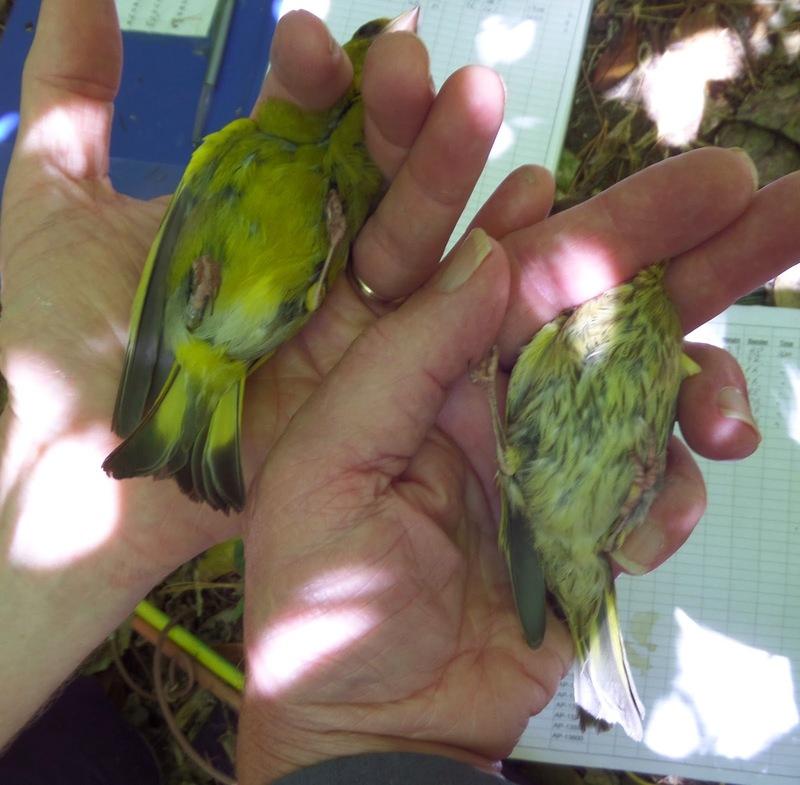 The first bird caught in 2015 - a Greenfinch recap. Chaffinch - 12 (1) the recap was banded at the Prince of Wales Park in March 2013 and is now the oldest recaptured bird banded there. One of the Chaffinch had started to moult its primaries. Greenfinch - 10 (4) One of the recaps originally banded in Dec 2009 is the oldest Greenfinch we have recaptured in the last couple of years. Silvereye - 14 (3) The oldest recap was banded in July 2008 so is a reasonably old bird. Interestingly although banded at the Zoo this is the first time it has been recaptured. Several of the Silvereye had also started their moult.